Carol Marcus' personal investigation into the cover-up following the Vengeance's crash into San Francisco leads her back into the path of Khan and Section 31. Put in the uncomfortable position of rescuing the man who killed her father, she has to deal with both the darkness at the heart of Starfleet and this new side of the augment that she discovers. Rebuilding Jim Kirk and the Enterprise turn out to be very similar tasks: they involve a lot of teamwork. Set during the 1-year interregnum at the end of STID. Contemporary with Dawn With No Chorus. A distress signal draws the crew of the Enterprise into the legacy of an ancient space station and its mysterious inhabitants. Drabbles, some of them WFWs, set post-Star Trek Into Darkness, during the five-year mission and surrounding the events of Beneath the Enormous Sky. 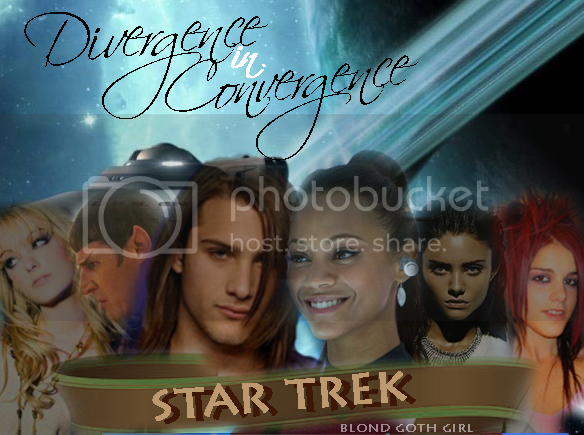 A collection of microfics surrounding Star Trek Into Darkness. Every possible spoiler for Star Trek Into Darkness lies within. Seriously, things are getting spoiled. A Post-Star Trek Into Darkness adventure during the five-year mission, in which an unpredictable nebula, a stranded alien starship, and some unwanted allies all conspire to make Jim Kirk's life more complicated than he'd like it to be. A post-Star Trek Into Darkness adventure, concerning a mysterious entity known as the Pilot. Spoilers for Star Trek Into Darkness. Summary: Captain James Kirk believed that the greatest challenges he'd face during his five year mission would be to learn diplomacy and to gain a solid friendship with his First Officer Mr. Spock. He had no idea that he'd face a challenge that would take a definite turn for the strange and so change the relationship he'd share with Spock forever. Summary: Sometimes, there are flashes of something... other. Summary: The Klingon Empire discovers that some Vulcans are not peaceful followers of logical philosophy. Summary: 5 Years after the destruction of Vulcan, extreme steps are taken to protect the Federations oldest allies and friends. After the destruction of Vulcan, the galaxy is in turmoil. Various factions come together aboard the Enterprise for peace talks with a Romulan Praetor who's not all that he seems but then again neither is anyone else. This story contains a lot of Romulan world building. Summary: To the world at large, Jim Kirk is a best-selling author. He also has a secret identity that involves doing things you wouldn't necessary want your mother to know about. Although his mother does know. Summary: While Scotty and Sulu lead a team to the damaged Sarah Spencer, a hidden menace lurks in the shadows. Summary: Adventures are only considered adventures after they're over and the only thing that Captain James T. Kirk can do is reminisce about how months ago he was saving the planet, beating the odds against a black hole, and firing torpedoes at their Romulan foes. Now as the crew of the U.S.S. Enterprise has begun work on one of their major functions (space exploration and mapping) he's beginning to realize that maybe being the captain of a fleet ship was not as glamorous as he once believed it to be. Upon receiving a choppy distress signal sent to Starfleet from an uncharted planet, Kirk and his crew are off toward adventure again to rescue the survivors of a critically endangered species. The crew must scramble to solve the mystery of the hunt of the Odoculan race, and answer the question of their remarkable abilities before it's too late for their new comrade. Her seemingly ageless appearance, her turbulent behavior and distrust in the crew make it difficult to study the aspects of her race. But the stone around her neck is not her deepest secret.